Harlem School of the Arts | HarlemGal Inc.
American Ballet Theatre and Harlem School of the Arts‘ Dance Department have formed a unique training partnership, which will incorporate ABT’s National Training Curriculum in HSA’s dance curriculum. Beginning Fall 2013, ABT will train HSA’s dance faculty in the principles of its National Training Curriculum. The establishment of an ABT Certification for HSA will provide a comprehensive training program in ballet for all HSA dance faculty, including student exams to evaluate teachers and students, refresher courses and mentorship. The partnership will be introduced to the Harlem School of the Arts community of dance families and students on Tuesday, May 21 at HSA’s Theater, 649 Saint Nicholas Avenue with a lecture- demonstration presented by the Jacqueline Kennedy Onassis School at American Ballet Theatre. As a part of the training partnership between American Ballet Theatre and the Harlem School of the Arts, JKO Principal Franco De Vita will conduct master classes at HSA throughout the year and serve as advisors to HSA faculty in order to effectively integrate the new ballet curriculum into HSA’s diverse offering of dance technique including jazz, tap, modern, African and hip hop. Interested in learning more about this partnership, contact Ruth Gilwit at rgilwit@hsanyc.org. Pulitzer Prize-nominated Eisa Davis will take to the stage in Harlem today for an intimate workshop setting, performing excerpts from her latest musical theater piece,Flowers Are Sleeping. The musical piece is a rare insight into the actor-writer-singer’s artistic process; a culmination of years of script development as well as more recent rehearsals in the Harlem School of the Arts’ studios and its ongoing Family Enrichment series. WHY:	Exclusive performance part of HSA’s Family Enrichment series, in promotion of performing arts center, Symphony Space’s world premiere of the full piece during Harlem Resonance Festival in April, 2013. Listen up parents, grandparents, etc! 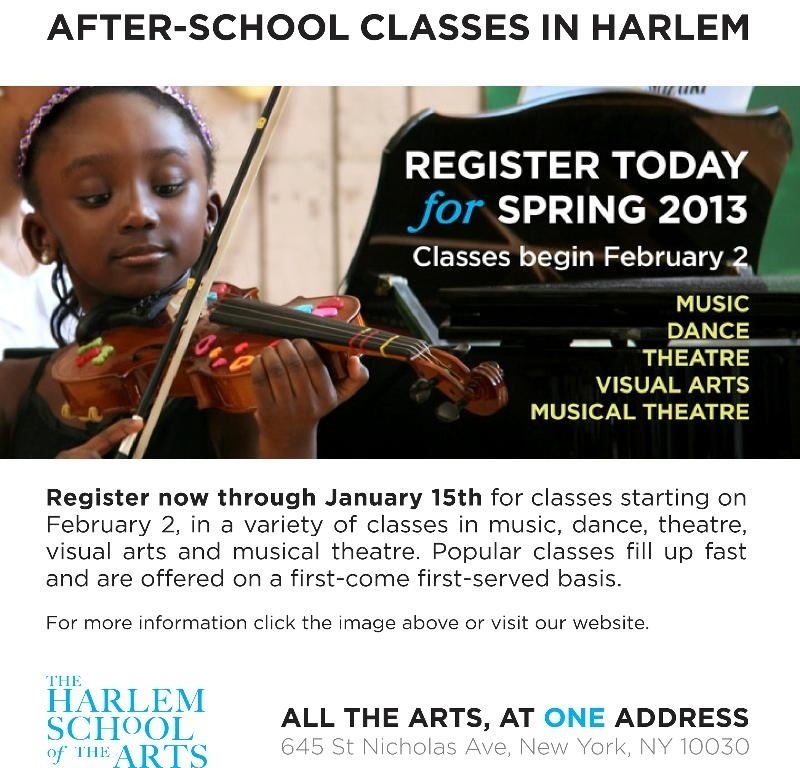 The Harlem School of the Arts registration for Spring After-School Programs starts pronto! 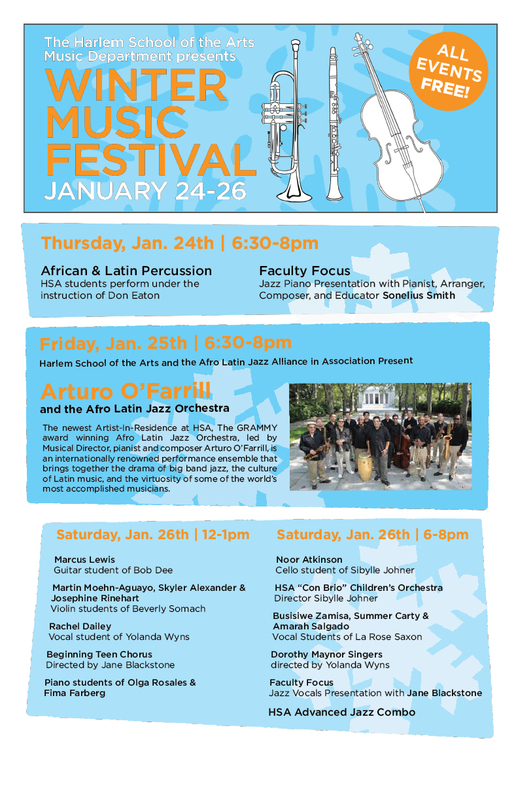 HSA After School Programs offers several classes in music, dance, theatre, visual arts & musical theatre. Classes fill up quickly so register right away , i.e. before February 2nd. To learn more, refer to graphic below or go here. Listen up parents! The Harlem School of the Arts (HSA) will be offering Free Class Week beginning Tuesday, September 4th thru Saturday, September 8th. Free classes will be offered in music, dance, theatre, visual arts, and musical theatre for all ages. The HSA Free Class Week is open to the public and free classes are offered on a first-come, first-serve basis. HSA Free Class Week culminates with HSA Parent Orientation for all parents of registering students on September 8th at 10am (for ages 2-8) and 2pm (for ages 9-17). All interested participants should go to the HSA website for more information. Additionally HSA will be holding open auditions September 11 and 12, Tuesday and Wednesday from 4:30 pm–7:00 pm for students Grades 3-8 who wish to participate in Disney’s The Lion King KIDS and The Lion King JR (its children’s version of its landmark Broadway musical) being held at HSA October 1 – March 18 culminating in student performances. Call backs will be held September 13. 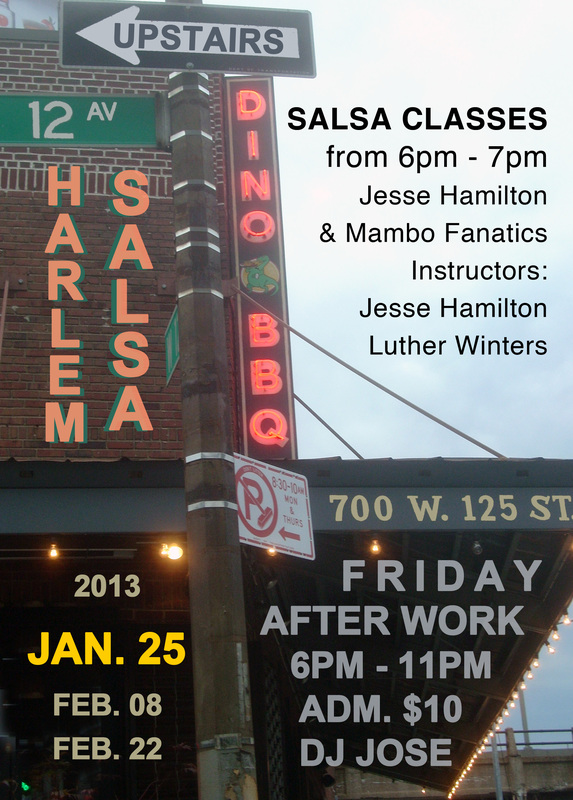 The Harlem School of the Arts is located at 645 Saint Nicholas Avenue @ W. 141st Street. Close to A, B, C and D subway trains to 145th Street or M3 bus to 141st Street. The good folks over at Harlem School of the Arts (HSA) sent in information yesterday notifying us that registration for Fall classes at the Harlem School of the Arts has started. It started yesterday, July 30! There is a five percent discount for students who register and pay in full by August 15. 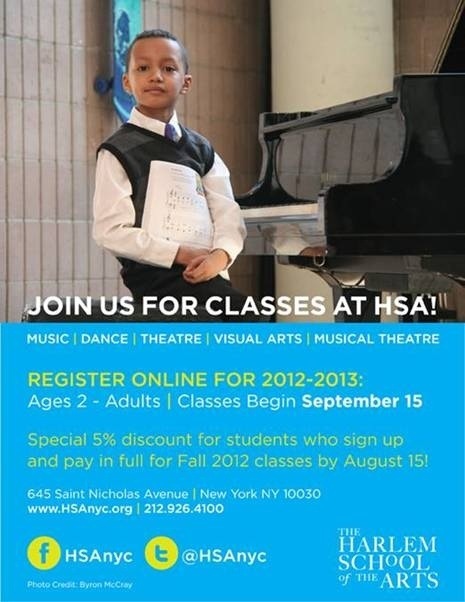 From toddler to the inspired adult, HSA offers 5 disciplines-Music, Dance, Theatre, Visual Arts & Musical Theatre. So if you are interested in registering for Fall classes at HSA, apply online. Get out your mouse pads folks! 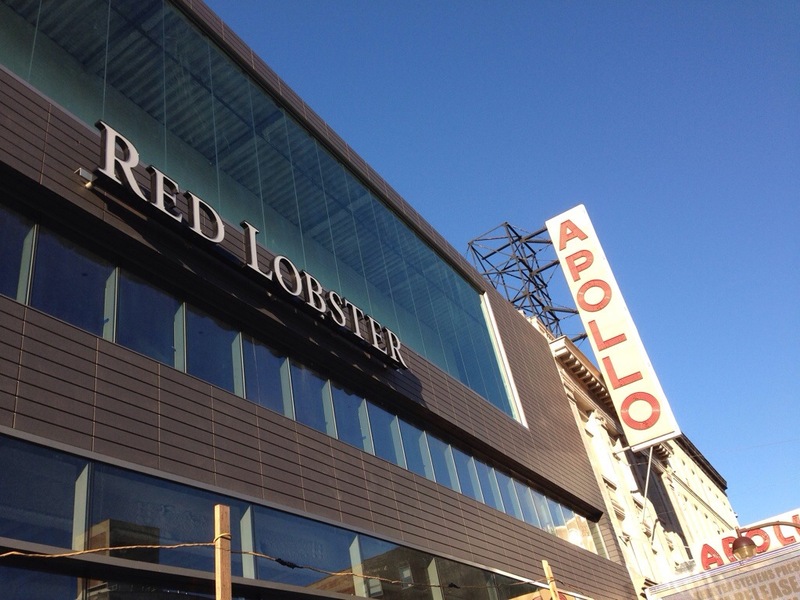 Harlem School of the Arts needs your clicks/votes pronto to win $25k in the Pepsi Refresh. The soft drink and snacks company is giving out mucho dinero to those with the best ideas in several categories. Harlem School of the Arts is competing in the Communities category. How can you help? Go online here to learn why Harlem School of the Arts is competing. Using the same link, you can either register to vote through Pepsi or use your own Facebook account. Voters can also use their smart phone to vote by texting: 109529 to Pepsi! According to the website there is about 13 hours left to vote! That is dog years on the online community so we have plenty of time to help out Harlem School of the Arts! Let’s go help them win!